A parliamentary report of 1777 recorded a parish workhouse in operation in River for up to 3 inmates. In around 1790, a Gilbert Union was formed by the thirteen parishes of Alkham, Buckland, Capel, Charlton, Dover — St James; Ewell, Eythorne, Folkstone, Hougham, Ringswould, River, Walmer, and Whitfield. The union set up a workhouse in a house on Valley Road in River, which in 1803 had 161 in residence. Inmates were employed in the knitting of hose, shoe-making, spinning, weaving woollen and linen cloths, and sacking. The West Cliffe Gilbert Union was also formed in around 1790 and included the parishes of East Langdon, St. Margaret at Cliffe, Oxney, Guston, West Langdon, Little Mongeham, Great Mongeham, Sutton, Ripple, and Westcliffe. The Union erected a workhouse on Martin Street in East Langdon. The inmates, who numbered from forty to fifty, were employed in weaving linen, sacking, sheeting etc. County of Kent: Alkham, Buckland, Capel-le-Ferne, Charlton, Coldred, Denton, Dover—St James the Apostle, Ewell, Guston, Hougham, East Langdon, West Langdon, Lydden, Oxney, Poulton, Ringswould, River, St Margaret at Cliffe, Sibertswould or Sibbertswould, West Cliffe, Whitfield, Wootton. The population falling within the Union at the 1831 census had been 10,551 with parishes ranging in size from from Oxney (population 7) to Dover—St James the Apostle (2,169). The average annual poor-rate expenditure for the period 1831-4 had been £7,416 or 12s.1d. per head of the population. Two years after its creation, the union was renamed the Dover Poor Law Union on 12th May 1837. The union's new workhouse was designed by George Lancefield of Canterbury following Sir Francis Head's model courtyard plan which was also adopted by other Kent Unions such as Bridge, Cranbrook, Dartford, Eastry, East Ashford, Eastry, Malling, and Tonbridge. 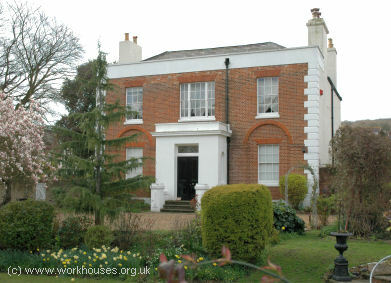 The workhouse, which opened in 29th September 1836, stood on what became Union Road (now Coombe Valley Road), Dover. It was designed to accommodate 500 inmates and its construction cost £5,970 plus £404 for the land. The workhouse location and layout are shown on the 1906 map below. The entrance block on the north side contained the Guardians' board-room and the Master's quarters. Narrow ranges around the central courtyard contained the inmates' accommodation. The main workhouse building was redeveloped after the First World War and no longer exists, although other structures do survive. A children's block was erected along Union Road to the west of the workhouse. Dover children's block from the north-west, 2001. Dover children's block from the south, 2001. Soon after the workhouse opened, a hospital block was added on the terrace to the south of the workhouse. It was joined in 1884, by a new infirmary block, designed by Cresswell and Newman. Infirmary extensions and a nurses' home were added in 1901-2. Dover infirmary blocks and nurses' home from the north, 2001. 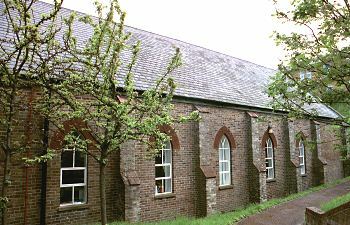 A chapel of unknown date was built at the west of the main workhouse building. Dover chapel from the west, 2001. The former workhouse was used as a casualty hospital during the Second World War and from 1943 was known as the County Hospital. After the inauguration of the National Health Service in 1948 it became the Buckland Hospital. Canterbury Cathedral Archives, The Precincts, Canterbury, Kent CT1 2EH. Baptisms (1855-1928).